I have been interested in the colorful history of Colorado's San Juan Mountains for a long time and, especially, the toll roads and short line railroads built by Otto Mears. One of the most intriguing engineering marvels is the turntable built on the Silverton Railroad near the ghost town of Ironton. I tried for a couple of years to make my way to the site of the old turntable and finally made it, along with my daughter, in July of 2010. There is more than one way to get to the Corkscrew Gulch turntable, the most common being to hike either the upper or lower grades of the old railroad bed. I've seen at least one website where they parked on the Corkscrew Gulch Jeep trail, climbed down and then back up Corkscrew Gulch, which is very steep and dangerous. I wouldn't recommend that, it's a lot harder than the route we took, which was to hike the upper grade. The upper grade is an easy hike of a little less than a mile and is almost completely flat. There are rocks, roots, and maybe some slick moss and mud to be wary of, but we thought it was pretty easy. We didn't see any bears, mountain lions, or tommyknockers, but they're most likely out there, so be careful. We turned south off of state highway 550, the Million Dollar Highway, onto Ouray county road 31, at waypoint 1. The turnoff is between Ouray and Silverton, Colorado and is very close to mile marker 83. County 31 is a dirt road that can be driven in a high clearance 2-wheel drive vehicle to the point where we parked, but I would highly recommend a Jeep-type 4-wheel drive vehicle. There are a couple of minor roads after you get past waypoint 4, but just stay level, don't turn uphill or downhill, and you'll be fine. At this point you are driving on the old upper railroad grade and it is pretty flat. There is a private cabin near where you park at waypoint 5. Please respect their property and privacy. Lastly, and I really hate having to do this, if you decide to go to the Corkscrew Gulch turntable, you do so at your own risk. If you get eaten by a bear, if you knock a big hole in your oilpan, if you get stuck in the mud and freeze to death, if ANYTHING happens to you, it isn't my fault. You go at your own risk. Be smart, know your limits, rent a Jeep in Ouray, and be safe. One more thing. Please do not take any artifacts. It's very tempting to take home a souvenir, but it's against the law and very uncool. If everyone took an artifact pretty soon there wouldn't be a turntable for any of us to enjoy. 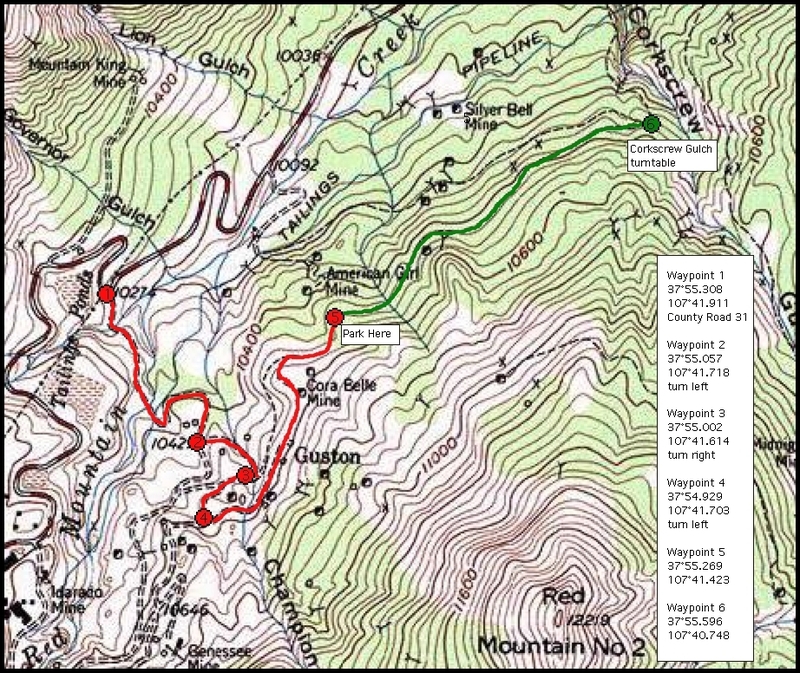 Topographic map showing the route we took to get to the Corkscrew Gulch turntable. Drive the red, park at waypoint 5, and walk the green. It is a very easy walk, almost completely level. The old wooden ties are easily seen in many places. and a little mud and moss. The upper and lower grades come together. Another view from the side. Part of the turning mechanism. Well, that's it. I have many more photos, but only so much web space. I hope you have enjoyed your virtual trek to the Corkscrew Gulch turntable. We certainly enjoyed visiting it and plan to return again and again. Be safe.